What you know of as @Windows 8.1 that you buy in stores will not be free with Win10. Can upgrade to Win10 for free but have to buy if new. People want to be mocking of that [Fifty Shades of Grey]. But bloody hell, that’s amazing—that [EL James] turned her fandom of something into something that’s an industry in itself. Why are we not applauding until our hands bleed? No, we mock her. We say, “Oh, it’s not very good.” Except she managed to write something that everybody wants to read. It’s “not very good”? By what standard is it not good if loads and loads of people love it? “Why don’t you f–k off!” It’s not for me, but I think she’s awfully clever. 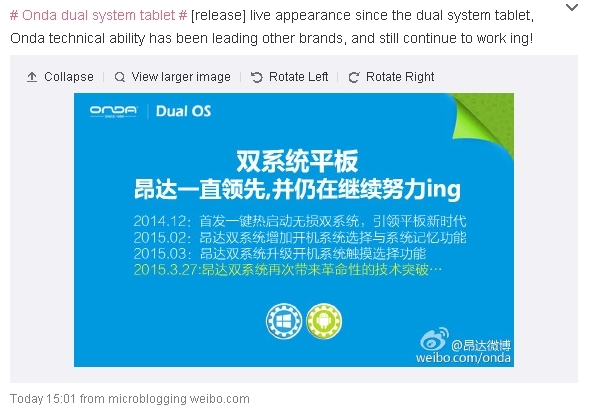 Today Onda announced, via Weibo, their dual-OS “breakthrough.” The Weibos follow. My own Weibo account is borked for today, so only small images can be included. Eight-inch 1280 x 800 screen, Intel Z3735F CPU, 2GBs of RAM, 64GBs of internal storage, 2MP front and 5MP back cameras, 4,500mah battery. For 699 yuan. That’s about US$112. More details at the Pipo forum [Google Translate]. 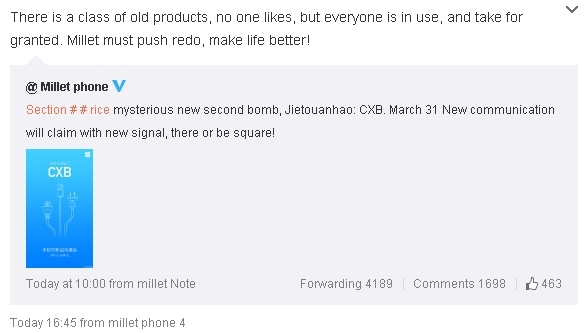 Expect the same from others and for a tablet like this to drop in price by probably half towards the end of the year. Something has gone wrong with my Weibo account. I’ve been asked to sign in (I usually don’t sign out) — and now it’s saying the email I used to register isn’t recognized. If my account has been deleted, this is a big disaster for me. I didn’t bookmark all the new accounts I added since getting an account. Same-day update: My Weibo access is totally fucked for today. Will try to access it as best I can using limited number of old Bookmarks. Screensnaps will look different, without account logos.